Protecting the computer lab can be challenging as it was meant to be easily accessible to the student. 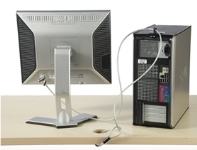 Our PC Tab alarm system, Guardian desktop locks, and CPU Enclosures help ensure your computer equipment will be available when you need it. The PC Tab Alarm system provides a unique way to secure multiple computers in a computer lab and alert you to possible theft by contacting a Security Department, Monitoring Service, or whomever you designate. Each additional computer in the computer lab can be secured for about $15. Keep the equipment in your computer lab safe with our Guardian desktop lock kits which allow you to secure up to 3 pieces of equipment with one kit. Built in the USA and available in any key option you need. Secure the computers in your computer lab with computer lockers and custom pc enclosures.